Magic mouthwash is used to treat oral mucositis, or mouth sores, such as ulcers and sores from chemotherapy drugs. Over 40 percent of cancer patients receiving chemotherapy will get mucositis, according to registered nurse Carolyn Vachani, writing for the Abramson Cancer Center of the University of Pennsylvania. While there is no single formula for magic mouthwash, it always contains at least three prescribed ingredients. These may depend on the specific type of sores being treated. 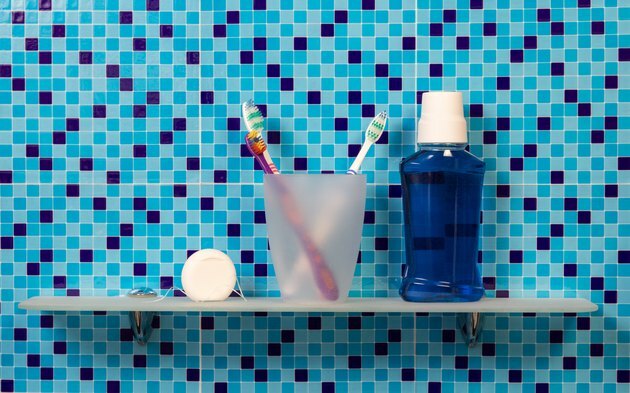 Some magic mouthwash formulas contain an antibiotic to treat or prevent secondary bacterial infections around the sores, states the Mayo Clinic's Dr. Timothy Moynihan. The 2007 Therapeutic Research Center Pharmacist's letter lists several different magic mouthwash formulas containing the antibiotic tetracycline. Mucositis is often accompanied by a fungal candida infection called thrush. An antifungal medication such as nystatin reduces fungal growth, and is often added to magic mouthwash. Nystatin comes in powder, tablets or a liquid suspension, according to the Mayo Clinic. The powder or liquid suspension is used as the antifungal agent in magic mouthwash. Most magic mouthwash formulas also contain an antihistamine such as diphenhydramine, or a local anesthetic such as lidocaine. These reduce pain and discomfort, according to Moynihan. An antacid--the same type you would take for soothing an upset stomach--is added to magic mouthwash to coat and soothe the inside of the mouth, and to enhance coating of the other ingredients. Kaopectate, containing bismuth, can make the mixture solidify. It is not used in Canadian magic mouthwash formulas, and the Pharmacist's Letter recommends using Maalox instead. Steroids or corticosteroids are a very effective anti-inflammatory agent and are often added to magic mouthwash to reduce swellings from sores and lesions on the tongue and inside of the mouth. However, the Pharmacist's Letter notes that corticosteroids such as hydrocortisone or dexamethasone have not been studied enough to prove their effectiveness in a mouthwash.